What’s More Effective: Hand Dryers or Paper Towels? Paper towels and electric hand dryers are both commonly used in commercial spaces, but which is the most effective option at drying hands? This has been the subject of many studies and reports over the last few years but the answer depends on a few different factors, so let’s weigh up the pros and cons of the two options. Electric dryers minimise the litter and mess that paper towels can create in some high traffic areas. High speed dryers, in particular, offer lower environmental impacts over paper towels. Hand dryers can range from 0.02 to 0.18 cents per dry compared to around 1 cent per paper towel. This certainly adds up in high traffic areas and means high efficiency hand dryers can offer up to 98% cost savings on paper towels. There have been dozens of studies exploring whether paper towels or hand dryers are more effective in killing the bacteria that build up on our hands, but many of these studies have either biased sources or faults with their methodology. 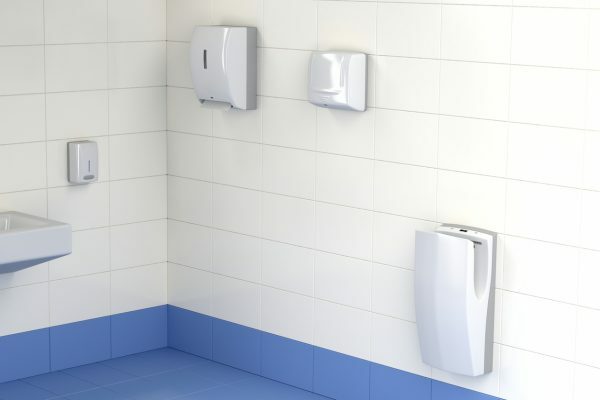 At the moment, single use paper towels and hand sanitiser are the standard option used in hospitals and healthcare settings while high speed hand dryers are common on high-traffic areas such as airports and public bathrooms. What’s clear is that washing hands thoroughly with soap and water can remove a vast majority of the harmful bacteria on our hands. It’s easy to argue that this is the single biggest problem with hygiene – after all, in one recent study, while 99% of people said they had washed their hands after going to the bathroom it was found that only 32% of men and 64% of women actually had! Following hand washing, it’s important to dry hands as quickly as possible because wet hands spread more bacteria than dry hands. The best option is the one that actually gets used, so think about how much traffic and space your washrooms have and how people will interact with the space. If there are likely to be long lines for a conventional hand dryer that lead to people giving up and leaving, consider a high speed dryer or paper towel dispenser instead. You might choose one option alone or to provide both to give people the option they prefer to avoid them walking out with still-wet hands. To find the right solution for your commercial washroom, browse through our hand dryer and paper towel dispenser range and contact the Davidson Washroom team on 02 9648 3570.